Are your customers safe while using your website? If your website collects and transfers information through enquiry forms or online payments, your visitors are trusting you to protect their data. The easiest way to protect your customers’ information is to install an SSL certificate on your website. Don’t know what SSL certificates are about? Don’t worry; we’ll explain what an SSL certificate is, and why you need one, in non-technical language. SSL stands for Secure Sockets Layer, which is a security system for your website to send and receive information. SSL technology encrypts data such as credit cards or other sensitive information. Encrypted data is harder for hackers to intercept and use. When a website browser and server both have an SSL certificate, they can communicate encrypted information via a secure connection. How do I check if I have an SSL certificate on my website? The quick way to check if your website has an SSL certificate is to look in your browser’s address bar. Check a few pages to make sure the SSL certificate is valid across your site. It’s quite common for an SSL certificate to be installed but not applied to all pages in the website, which is bad for your website security. 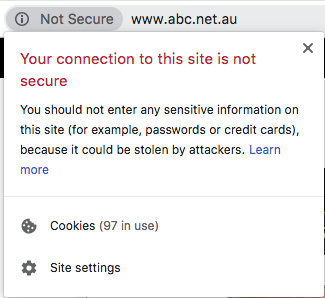 Google Chrome browser now labels HTTP sites as “Not Secure”. Mozilla Firefox and Internet Explorer are also marking websites as “Not Secure” if they don’t have HTTPS. If your website collects any kind of information from visitors, you owe it to those visitors to protect their information. Use external payment processing like PayPal or Stripe? Then you need an SSL certificate to protect the transmission of visitor data. Did you know that hacking and data theft costs Australian businesses millions of dollars each year? Not to mention the damage to a company’s reputation once their customers’ data has been stolen. You might have heard about some of the big ones; private information like usernames, email addresses, passwords and even dates of birth have been stolen from huge companies like Facebook and MyFitnessPal. In 2016, Commonwealth bank lost 15 years of backup data for 20 million customers. If you’re thinking, “But my business is tiny, what would hackers want from me?” – know that it can happen to any business. No business is too small to be a target. Even if your website doesn’t collect any data from visitors, you should still have an SSL certificate on your website. That’s because the SSL certificate’s “Secure” marker is a trust signal for customers. Websites marked “Not Secure” place an element of doubt in the customer’s mind and make them wary of handing over private information or payment cards. A secure website makes your business look legitimate and trustworthy, so customers feel confident engaging and shopping with you. Online shoppers are getting savvy. They’re not going to risk their data being stolen; they’ll simply close a dodgy-looking website and shop where they feel safe. In fact, having an SSL certificate on your website can increase your conversion rate. That’s right: customers are more likely to buy through your website when they feel secure. What’s more, the increase in sales is likely to cover the cost of your SSL certificate, which makes a good return on your investment. Does SSL help with my Google ranking? In early 2018, Google announced that it is encouraging HTTPS encryption for all websites. Starting from July 2018, Google is penalising websites that are not secure by dropping them down the rankings. A “Not Secure” penalty could be enough to make your previously high-ranking website drop from page 1 to page 2 or 3, where fewer people look. That drop in ranking can lose a lot of website traffic, and cost a lot in lost sales. If you’re running an unsecured website and you have Google Analytics installed, have a look at your website visits since July. Has your traffic dropped? If so, the reason could be your unsecured website and the ranking penalty. Avoid the Google ranking penalty by making sure your website is secure. That one little letter S can make a big difference. It’s best to ask your website developer to install the SSL certificate for you. As part of the SSL set up, your web developer will redirect all existing links coming to your http:// website address to the new https:// website address. Permanent redirections are like telling the post office that you’ve moved house and to which address they should forward your mail. Having a pro do this for you will make sure that you keep all your hard-earned backlinks and help your website maintain its Google ranking. Your web developer can also help you choose the right level of security for your website. Websites that don’t collect much customer data may only need basic protection, while websites with multiple sub-domains, customer log in access and payment portals will need higher security.